It's an interesting problem to tackle. How do you identify the traits of a movie? Genre is the first that comes to mind, but certainly more is required to recommend a movie. Simple classification such as "Comedy" doesn't necessarily mean I will like Superbad if I enjoyed Tenacious D: The Pick of Destiny. Other than the "Comedy" link, do YOU see any other similarities? I don't. OK, what else can movies be related on? What about cast and crew? Ah-HA! Orange County and Walk Hard have the same director and both feature actor Jack Black. Are those truly related criteria, though? Jack Kasdan also directed indie crime thriller Zero Effect. If Jack Black was in Zero Effect, would CineMatch have recommended it, too? Again, movie recommendation is an interesting problem. I wonder if it could ever work like music recommendation engine Pandora. Check out what I mean by reading this page at How Stuff Works. Could we identify such specific things as plot elements as seen on IMDB.com pages? If I liked a movie with a memorable "peacefully gazing at the night sky" scene, could be there be any recommendation significance to a movie with a similar scene? p.s. 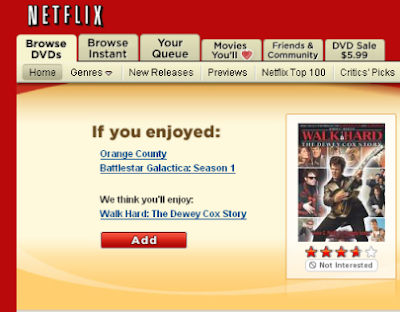 If anyone can find one single similarity between BSG Season 1 and Walk Hard/OC, please comment! pps - there is ZERO whitespace or code inbetween the paragraph and the table of genre tags in the blogger code of this post. where the heck is all that whitespace coming from? if you win a million dollars, will you take care of the bills for a while? Maybe Dewey Cox is a Cylon? I've had some unusual "If you liked this..." results with Amazon.com too. Somehow PSPs and Family Guy are related. i think that a big component of their current system is looking at numbers of people that rated those highly. So my guess is there happens to be a more than statistically significant portion of the netflix population who gave 4 stars or more to those three movies, and who also match many of your other favorite movies. I think it works off of similarity in rating as much as it does off of movie descriptions, where as pandora works all off what you like and not what other people liked too. I think that there are certain movies that, if given ANY kind of good rating, should result in the renter losing their Netflix membership! For example, Battlefield Earth, Judge Dredd, Evolution, etc. What other films are so bad that I can use them to screen out people with no taste? !